Vinyl is the most popular siding material available today, thanks to its excellent durability, easy maintenance, and tremendous range of styles and colors. 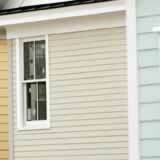 It's also one of the most affordable siding products on the market today. Vinyl siding prices vary, however, which makes it difficult to estimate costs. The following guide can give you a ballpark figure, but is no substitute for an estimate from a siding professional. Traditional lap-style vinyl siding can cost as little as $0.45 per square foot for value-grade vinyl installed by a serious do-it-yourselfer, and more like $7 per square foot for a premium, professionally-installed product. The average 2,300 square-foot home requires about 3,200 square feet of vinyl, so would likely cost between $7,500 for value siding and $22,400 for premium vinyl siding. Additional expenses include up to $3,000 for removal of your old siding, and another $3,000 for paint if you choose a product that isn't factory primed and painted. Fascia, soffit, and other trim also influence final cost. Insulated vinyl siding also adds about $1 per square foot to your final cost, but will save you on your heating bill. Choosing vinyl siding styles beyond traditional lap-style or clapboard products boosts the cost; vinyl shingles, for instance, cost between $2 and $10 per square foot on average. In some cases, premium, high-grade styles can cost even more than their natural wood rivals, but will last longer and typically require less maintenance. Thicker products also tend to cost more than thinner vinyl panels, but offer improved durability and longevity. When it comes to buying vinyl siding, it's important to shop around. Higher prices don't always indicate higher quality. Request samples and quotes from multiple siding professionals in your area to find the best deal.